The location was off the beaten path in Boracay, however the privacy of the beach was unmatched. Fantastic location. Not too many people at the hotel or in the area. The staff was very professional and so nice. Breakfast is quite minimal but for a simple resort, it does the job! Food comes out fast and you won't be crazy hungry after your breakfast here. Also the rooms are quite spacious and the staff are very helpful (especially if you need to book the resort shuttle to go into town). The property itself is beautiful for the price you pay. Nice pool and rooms. I was really impressed with all the staff within the hotel, they were all accommodating. Even the main beach was far in the place they’ve tried to help us evey time we want to go. Rooms and pool are clean. Overall it was a great experience. Good and quiet location just few minutes from centre. Nice beach next to the hotel (but little windy). Wide and tidy rooms. Breakfast OK, everyday different, consist from eggs, ham/sausage and some fruit (watermelon/pineapple) and bread/bun, sometimes pancakes. Pool also nice and clean. Helpfull staff as well. We stayed longer than planned. I would definitely recommend it. 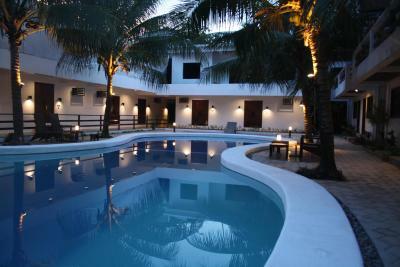 we like the rate its affordable,the rooms are big and the pool.its relaxing coz its not too crowded place. The hotels location of being right on the beach is fantastic! The pool was always beautifully clean. Breakfast was great too. Feliness Resort This rating is a reflection of how the property compares to the industry standard when it comes to price, facilities and services available. It's based on a self-evaluation by the property. Use this rating to help choose your stay! 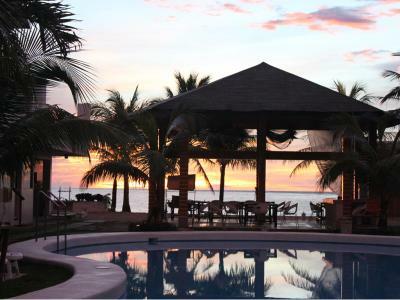 Set beside Tambisaan Beach, this resort enjoys a scenic location on Boracay Island. It offers a wealth of recreational facilities including an outdoor pool, beautiful garden and private beach. 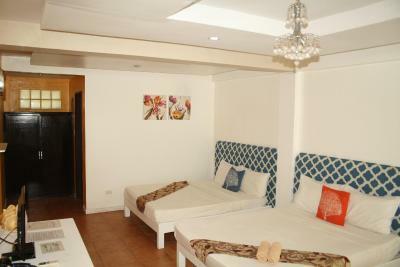 Feliness Resort Boracay features spacious rooms equipped with a TV and air conditioning. Free WiFi is available in public areas. The resort’s in-house restaurant serves freshly prepared American and Korean dishes daily. Guests at the Feliness Resort Boracay can enjoy relaxing days at the resort’s private beach. There is also an outdoor pool for children. The journey from Caticlan Jetty Port to Cagban Port takes 15 minutes’ by boat. Manoc-Manoc is a great choice for travelers interested in diving, sandy beaches and relaxation. When would you like to stay at Feliness Resort? A spacious, air-conditioned room featuring a small sofa, coffee table, small refrigerator and an electric kettle. It has a small veranda where views of the sea can be enjoyed. This room also has a private bathroom equipped with hot an cold water and complimentary toiletries. Air-conditioned room includes a cable TV, small sofa and coffee table. This room also has a private bathroom with hot an cold water and complimentary toiletries. House Rules Feliness Resort takes special requests – add in the next step! Please inform Feliness Resort of your expected arrival time in advance. You can use the Special Requests box when booking, or contact the property directly using the contact details in your confirmation. it far from the main. beach of boracay.. and the fare is very expensive going to dmall and back to the resort. the room is not clean.. This was by far the worst experience I’ve had with staff. We had traveled for 24 hours to get to the hotel and not a single staff at the hotel greeted us or seemed to bother to want to check us in. Every time we asked for any help it seemed like we were a huge inconvenience for them. Over all the staff was just some of the worst hospitality experience I’ve had in the world. Would never stay again even if the hotel itself was alright. Also if you’re an animal lover it might be uncomfortable since there is a monkey chained up to the front gate of the hotel. Exeleant place to sty and good quite location , hotel staff freindly . Some minor improvements needed in certain areas of hotel. But still very pleased with our stay. The hot water didn’t work while we were there, the bathroom could’ve been cleaner (rusted and molded shower curtain, dirty skin needed scrubbing). The bed frames were incredibly scratched and beaten up. Mismatched curtains in a way that seemed slapdash. No Filipino food on the menu and served food and beverages in chipped cups and plates. Overall failure in attention to detail in may areas or decor and development. we don't like the facade of the resort,the location is too far from boracay white beach.they have shuttle but there is schedule in going to white beach so you need to hurry if you want catch up with their sched. The interiors of the rooms felt a bit outdated but it was clean, spacious, and we even had our own balcony that overlooked the pool so that was pleasant. The 'restaurant' is actually an open area and we didn't really see people eating there (as we were close to D'Mall anyway - just a quick shuttle ride and walk to a huge selection of restaurants). Towel was not replaced everyday and you still need to remind the staff to change it. There's only one menu for breakfast.